A week in Vienna is plenty of time to see the sights and, more importantly, find the good vegan food! 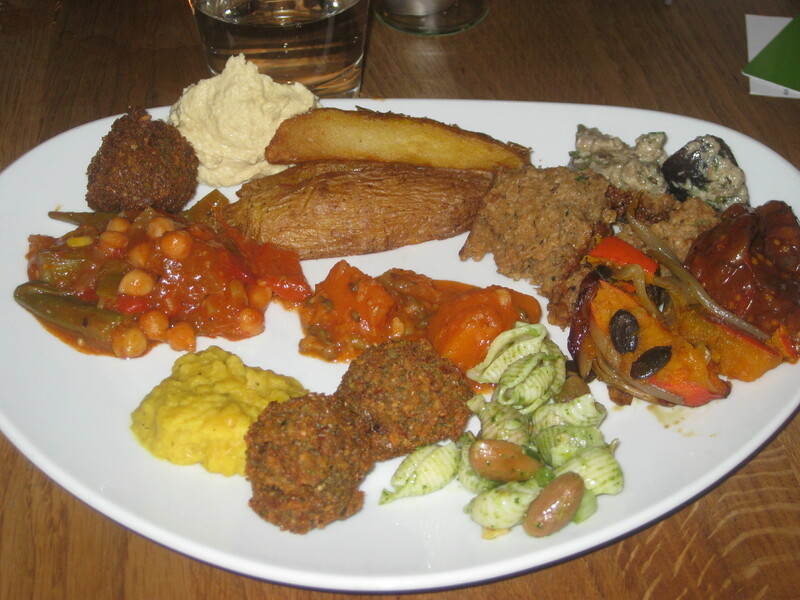 This is what I ate in the second half of my holiday, continuing from last week’s installment. 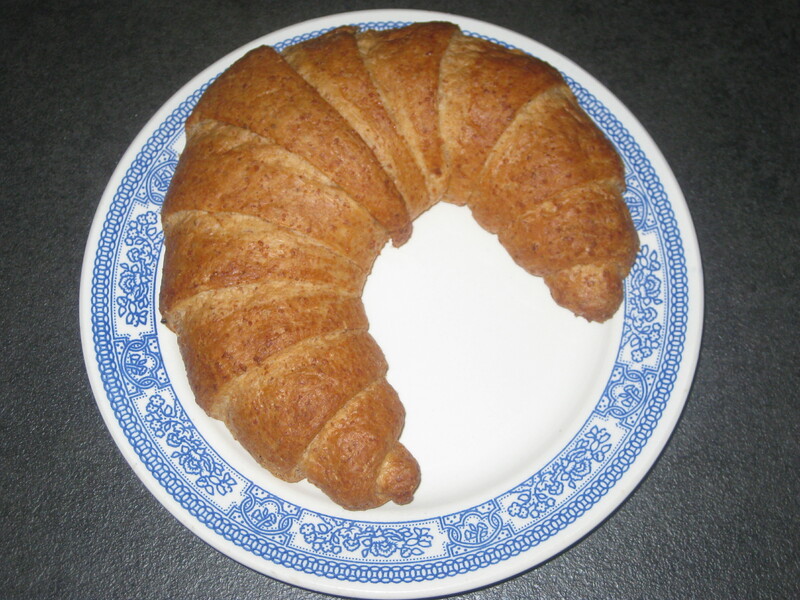 Before heading over to Bratislava for the day on Thursday, we tucked into these croissants from Maran supermarket. Like the chocolate and raspberry croissant the day before, it was more of a bread bun than a pastry, but it was delicious warmed up and slathered with this Nutella-like spread. We got back to the city quite late and wanted to find somewhere to eat that wasn’t too far away from the main station. The Happy Cow app obliged and we made our way to Delicious Vegan Bistro, a tiny little place just opposite the Naschmarkt. There were just two two-person tables (bright pink, as you can see! ), so I suspect they might do more takeaway business. There were a few staples on the menu, along with daily specials. This chilli was one of the staples. 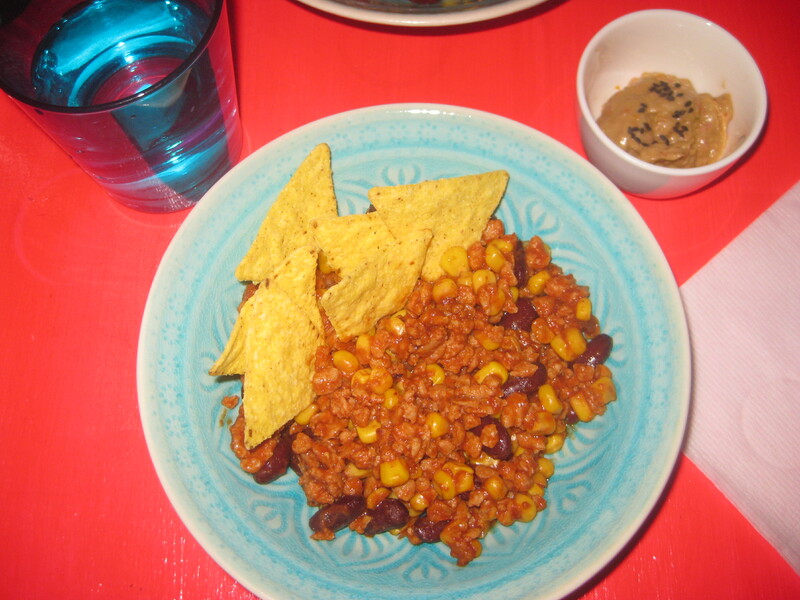 It was made with mince, sweetcorn and kidney beans, and accompanied by tortilla crisps and guacamole. It was nice, and the presentation was excellent, but I would have loved a bit more flavour: maybe some onion in the chilli or a bit more spice. The owner was really welcoming and passionate about veganism, so this is a great little place to support. I’d love to try some of their desserts too! Ah, another breakfast disaster. On their website, Fruhstuck und Mittag bei mir claimed to serve breakfast, including vegan dosas, until 10:30am. We arrived about an hour before that, and were told breakfast had finished and they could only offer us bread. We declined. Fortunately, Blueorange was not too far away. They serve bagels, including plenty of veggie and a few vegan ones, all clearly marked on the menu, and even a couple of vegan baked treats as well. 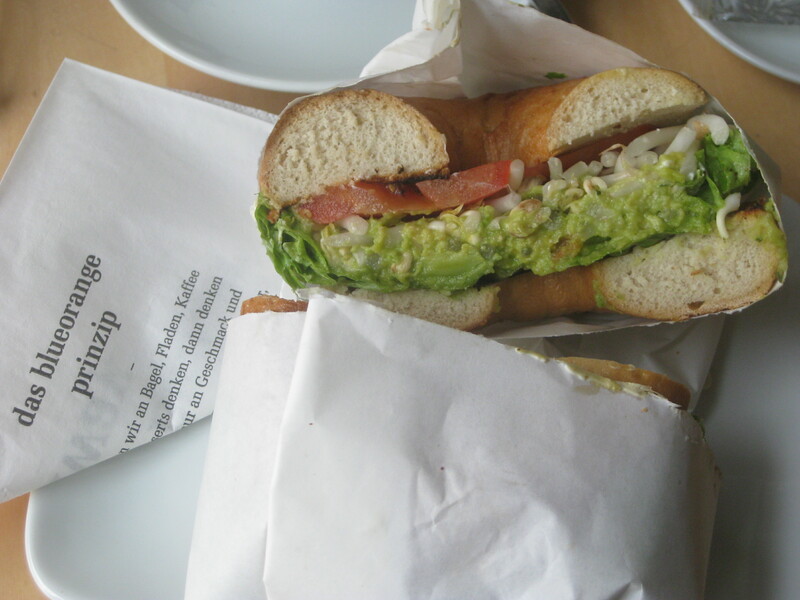 I had the avocado bagel, which was so humongous it made my jaw ache. But it was worth it! You can’t really go wrong with cool, creamy avocado and a bit of salad, can you? This was an excellent emergency find. We broke up the day with some cake, of course. The Easy Going Bakery was a great spot to recharge and refuel. It’s all vegan and has five chairs if you want to eat in. There is a very tempting counter offering numerous kinds of cupcakes – in this case, many of them with Halloween decorations. Everything looked and sounded amazing! There were also cake pops, cookies, raw cakes and cinnamon swirls. 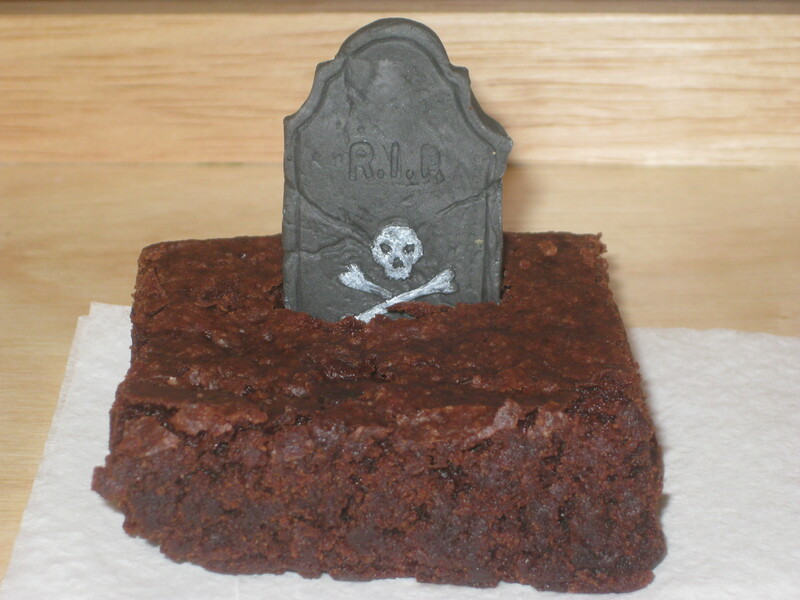 I went for a Halloween brownie, and feared it was a boring choice in face of all the cupcakes. But it was one of the best brownies I’ve ever had: a great crust on top, and a dense, fudgy, moist cake underneath. So good! 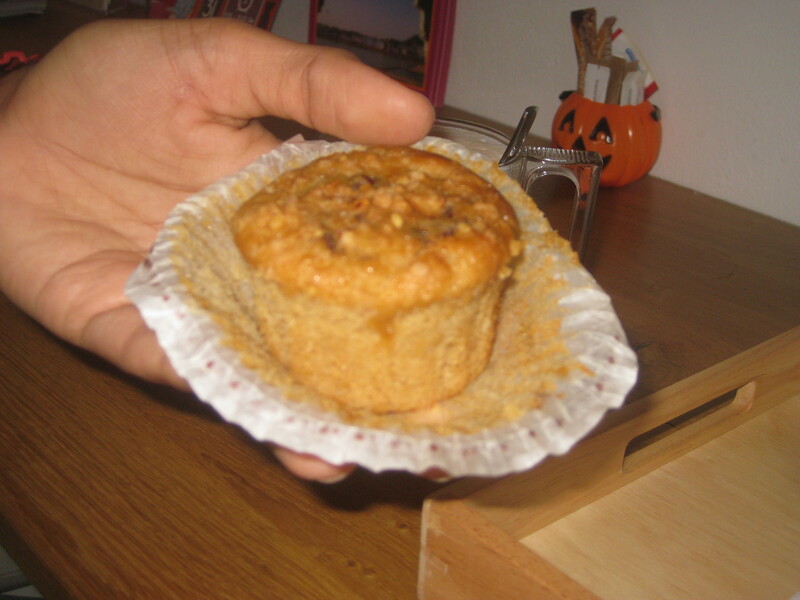 Dr HH was even more boring and got this undecorated nougat muffin, which he said was well-baked but needed more nougat. That evening we ate at Formosa which is a bit of an odd place: kind of Asian, kind of fast food, a bit difficult to pin down. It’s quite a small place, and the tables are in the middle of a pretty impressive veggie shop: some excellent chocolate bars, all the vegan cream cheese in the world and a lot of mock meats. The staff told me that everything was vegan, though that doesn’t match with the comments on Happy Cow. We decided to split two mains because we couldn’t decide what we wanted. 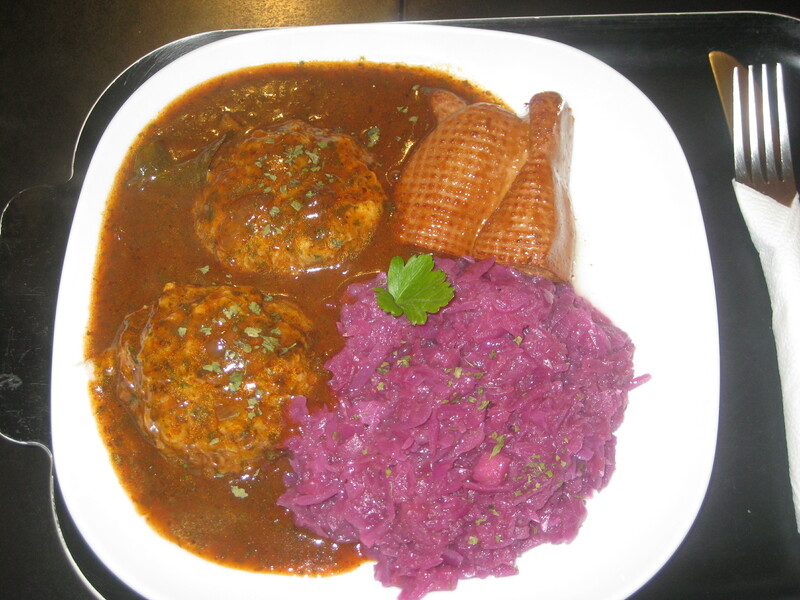 We knew we had to try the goose with dumplings and red cabbage, because who has seen vegan goose on a menu before? Neither of us knew what real goose tasted like, so I can’t comment on the authenticity. I can say it was a bit tougher than over mock meat I’ve had, and it tasted good. 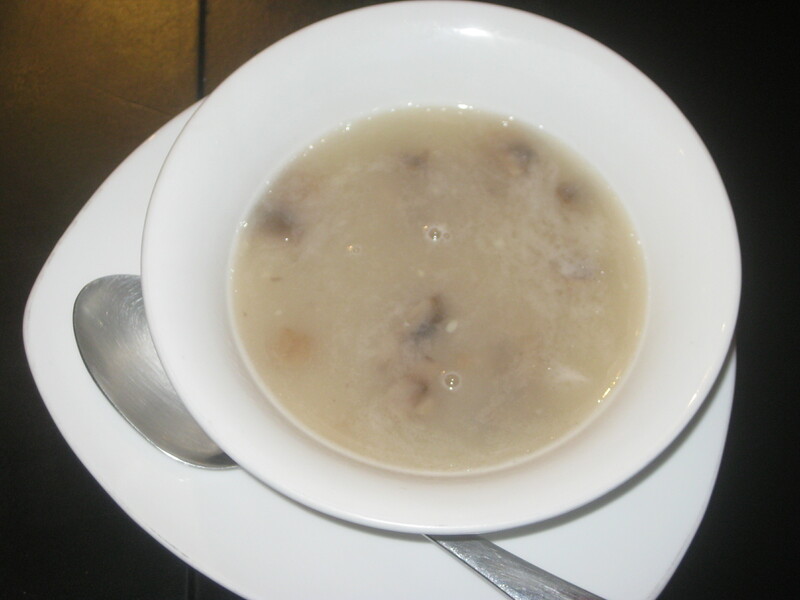 The dumplings weren’t as dense as I’d have liked, but the gravy has really flavoursome: all in all, a good dish. We also had the BBQ duck with rice and veg. 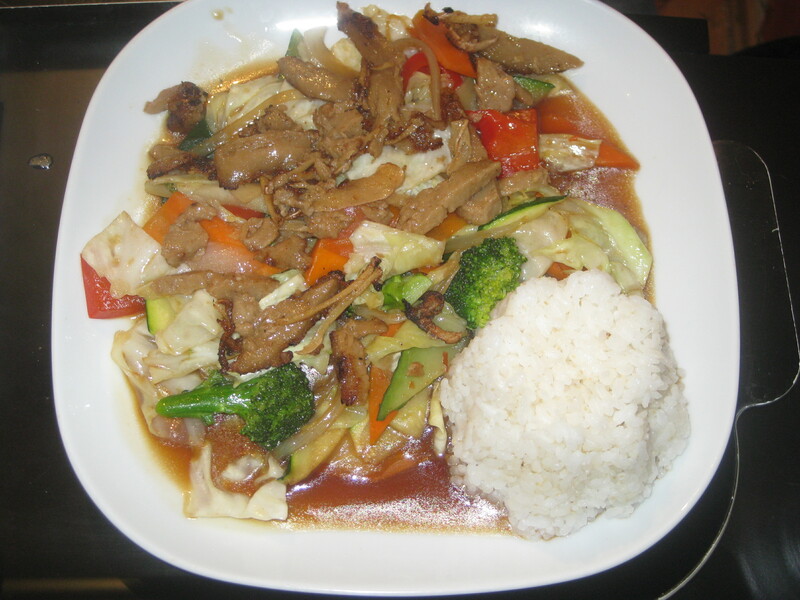 There wasn’t as much duck as I would have liked, but the sauce tasted fantastic (full of ginger and soy sauce), and the fresh vegetables were good. 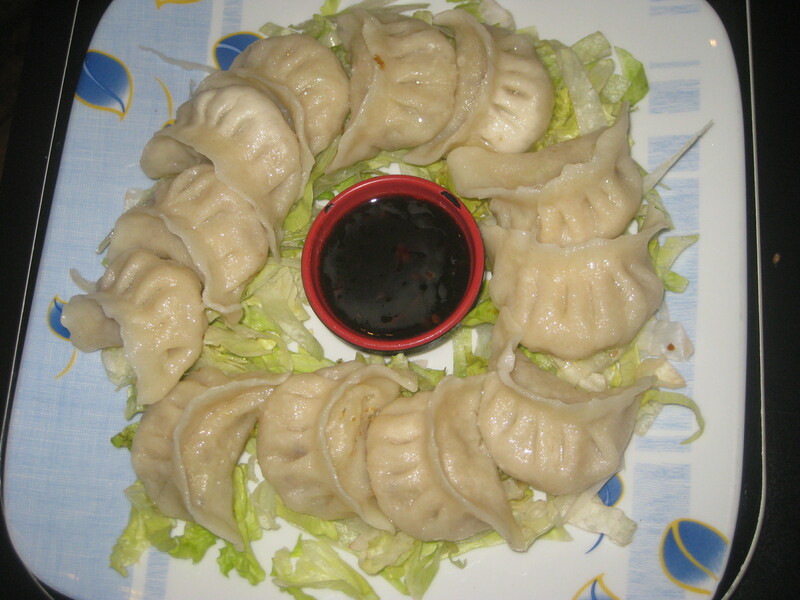 We also shared some dumplings, because we can never say no to them. Alas, the filling was pretty bland, but the dipping sauce brought them alive. 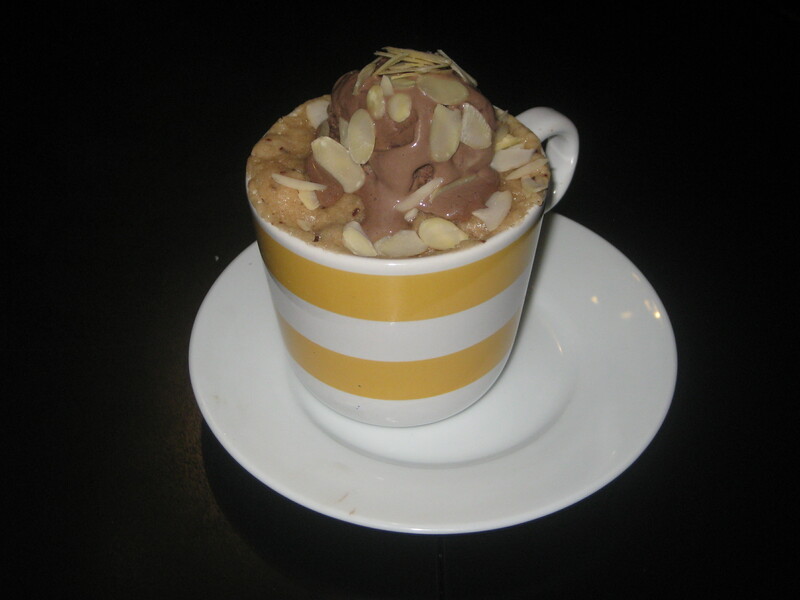 Rather unusually, the desserts were all microwave mug cakes. Once again, we shared. We got this vanilla chocolate crumb cake, which was a vanilla sponge dotted with chocolate chips and topped with creamy chocolate ice cream. It was cooked right to the bottom, and was really enjoyable. Formosa isn’t the fanciest of places, but it’s pretty solid and I liked seeing some unusual options, such as goose and mug cake. 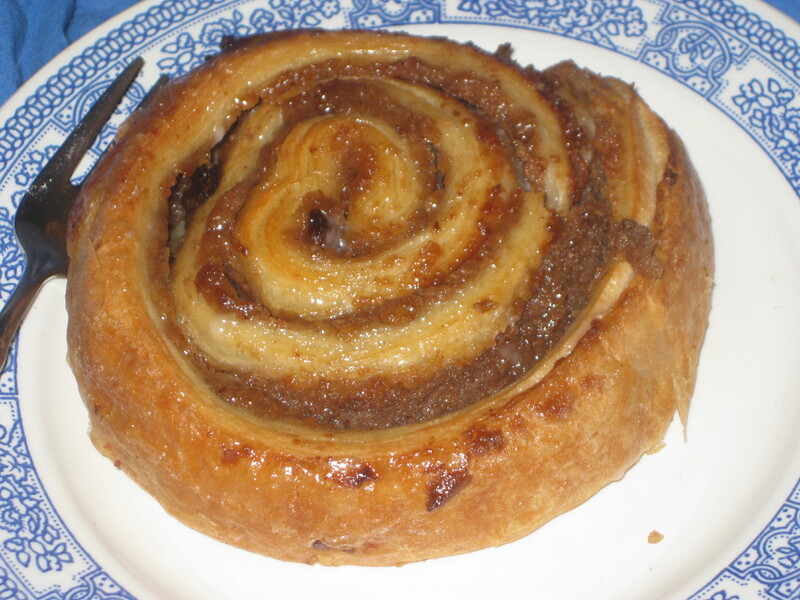 The next day started with cinnamon swirls, purchased in advance from Veganz supermarket. It is an extremely well-stocked little supermarket, with fresh food from Pirata Sushi and baked goods from other local eateries. These swirls included raisins and nuts, and they were gooey and soft and delicious. 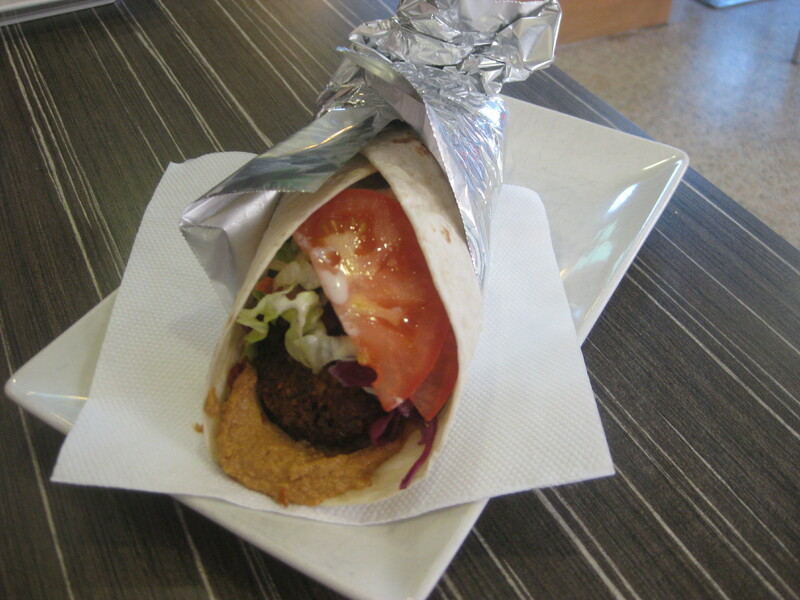 I mentioned in part one that we found some long-awaited, excellent falafel. Well, we found some more that I think was even better, courtesy of Dr Falafel at the Naschmarkt. There are signs proclaiming the falafel wrap to be vegan, and the hundreds of hummus varieties are all clearly labelled so you know which ones are safe to eat. It was a cold day and the market was packed, so we decided it was worth paying more money to sit inside and eat. There were three giant falafel in there, flecked with green herbs, crispy and toasty warm. I wasn’t a fan of the huge tomato slices, but the hummus was slathered on so thickly, it was beautiful. Beautiful! 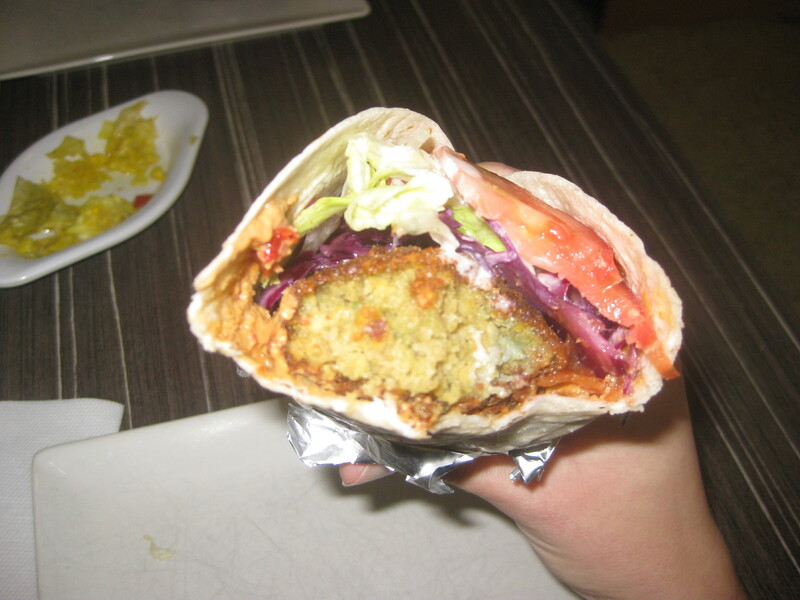 I’m now counting down until the Christmas holidays to get some good falafel in Manchester again. You can also buy a bag of falafel to take away and enjoy later. Definitely a good option if you’re on a budget. 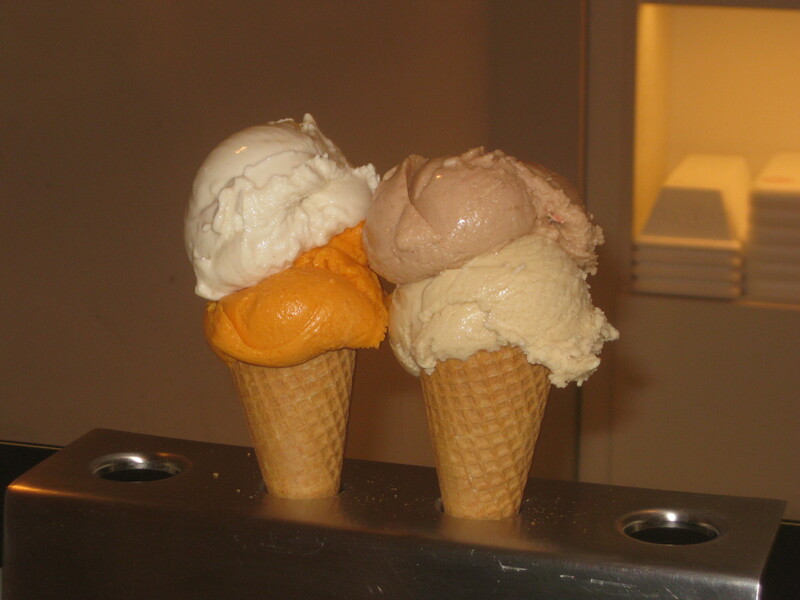 Even if it’s Halloween and pretty cold, the law states that if you find a place with vegan ice cream, you must buy some. And so we stopped by Veganista, which has two shops in the city and an impressive array of flavours, including some seasonal ones which cost a wee bit more. Dr HH was bold and went for pumpkin spice and toffee apple, both of which he enjoyed, especially the big chunks of apple. I was equally pleased with my less adventurous choice of oat-cinnamon and peanut butter. Both were creamy and full of flavour. There’s a row of five seats in the Margaretenstrasse branch, so we stayed in the warmth while we ate. It’s a fantastic little place, and I really recommend it, whatever the season. For our last evening meal, we’d booked a table at Yamm! (their exclamation mark, not mine). I love a good buffet, even if it’s pay by weight rather than all-you-can-eat, but things did not go swimmingly. First of all, despite being all vegan and vegetarian, they didn’t label on the menu which wines were vegan – one of my biggest hates in meat-free restaurants. And then it turned out that vegan wines were only available by the bottle or as part of a spritzer, but not in a glass alone. How inflexible and bizarre. And then the buffet itself. Dr HH (who is vegetarian) had, amongst other things: pizza, polenta lasagne, a dumpling, tortellini, arancini and deep-fried broccoli. None of those things were labelled as vegan, so I had gumbo as my only “main” dish, and lots of little salady sides. Quite disappointing when you compare the options for the two of us. The gumbo was delicious, but this was an expensive plate of sides. Fortunately, the dessert counter had a better proportion of vegan options. 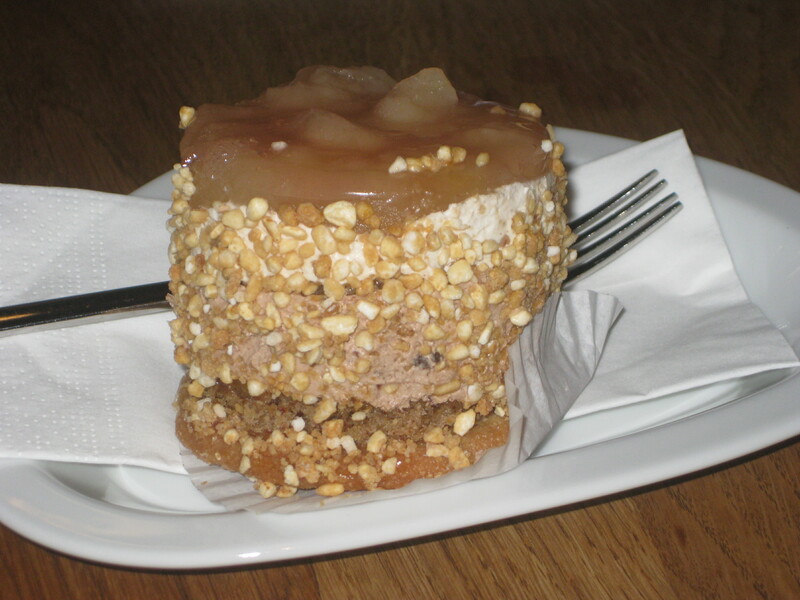 We split this lebkuchentortchen, which had a biscuit base, layers of sponge and chocolate and vanilla cream and apple jelly on top. It was divine and ensured that I actually left in a good mood. Despite being underwhelmed by the evening buffet, we went back to Yamm! for breakfast on our last day in Vienna. Well, we’d already booked, and the menu promised “two pastries” in the vegan breakfast. Thus we experienced the Great Pastry Debacle of 2015. Yes, those pastries turned out to be bread buns. Once again, I was devastated. It meant that the vegan breakfast was all savoury, and I’d have preferred just going back to Blueorange for another excellent bagel than eating this rather underwhelming, overpriced plate. The carrot and orange juice was really nice, but a very small glass. The sausage from the menu turned out to be a few slices of salami. It was all a bit disappointing. Still, it filled me up and kept me going on the train home. I can’t recommend Vienna enough as a tourist destination. 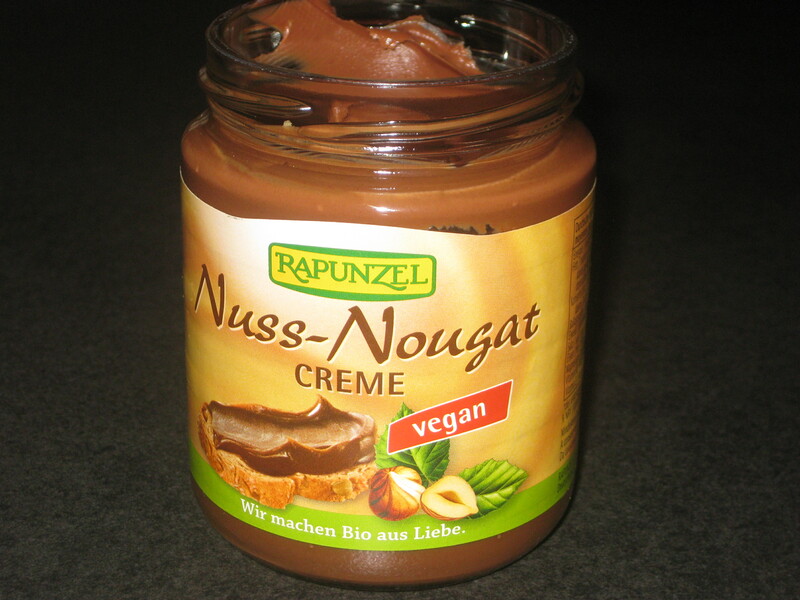 It’s so great for vegans – there were loads of other places I wanted to try, but we just didn’t have time. And it’s also a jaw-droppingly beautiful city, with lots of things to do. 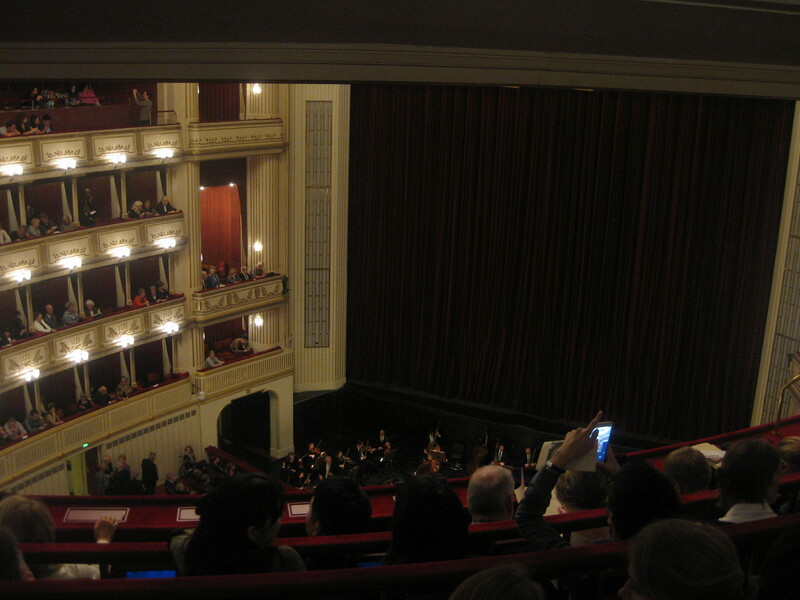 One of our highlights was attending a performance at the opera. The building was gigantic, we actually gaped at it from outside, and the interior was extremely fancy. It was so fancy we weren’t even allowed to take coats in with us, they had to be left in a cloakroom (which makes a quick escape at the end virtually impossible) – thus exposing Dr HH’s Optimus Prime t-shirt to our company. It’s safe to say we were among the more casually-dressed visitors. We paid under 50 euros for our seats, but you can also queue up on the day and get a standing ticket for just a few euros. We were underwhelmed by Mumok and the Secession, besides the excellent Beethoven Frieze, so instead, I would recommend the Albertina for an art fix. 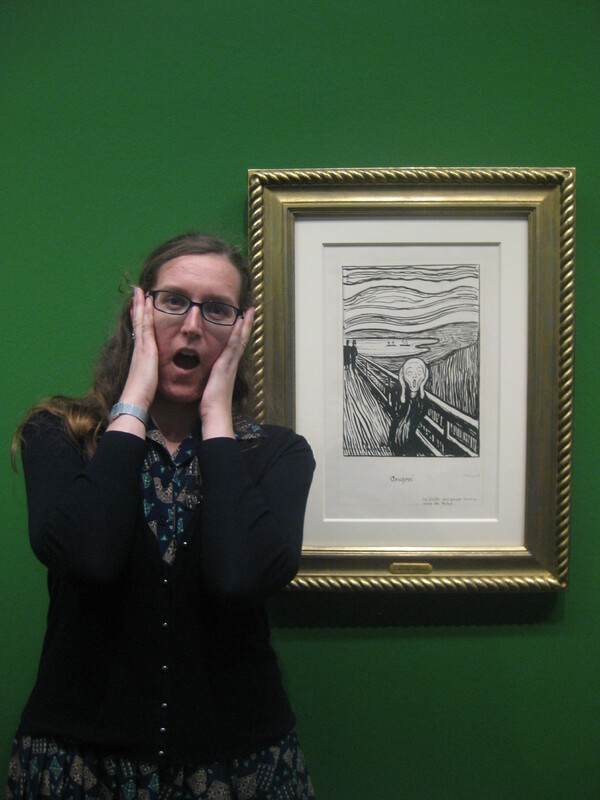 They had some great impressionist work, and also an Edvard Munch exhibition. I was really excited when we saw The Scream in black and white, but to be honest I found the full exhibition really depressing and gloomy. In the Augarten park near our airbnb, there was quite a fun little art gallery called Thyssen-Bornemisza Art Contemporary. We had to take our shoes off and leave our bags in lockers before we could enjoy the temporary exhibition. One room was like a soft play area with lots of maracas to rattle, the next had some kind of large crochet tent, and the final one had hammocks. 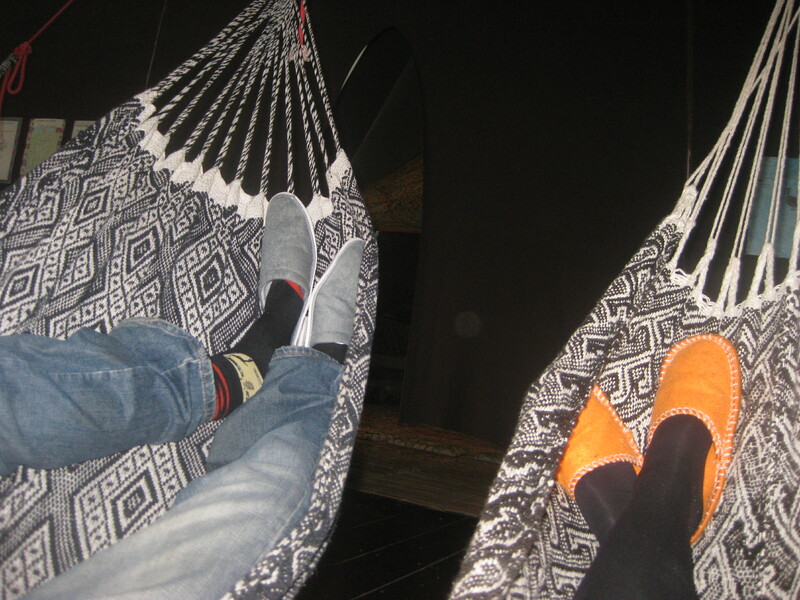 Any tourist welcomes the chance to rest their feet, so we enjoyed a good lounging session. This looks like a great gallery to keep an eye on. Schoenbrunn Palace looked very impressive, though we merely enjoyed it from the grounds. Walking around the city centre can take up loads of time, not because everything is spread out but because you have to stop every thirty seconds to gape at something else. St Stephen’s cathedral is really impressive from the outside, with its jazzy roof, and inside, with its doom and gloom. It’s a proper, imposing old church! We climbed the tower, which is 343 stairs high, spiralling all the way. You will get dizzy. Unlike most towers we’ve climbed, once you get to the top you do not emerge into the open air but into a gift shop with windows for enjoying the view. For me, this was perfect: usually I spend my time on church towers clutching the wall with one hand and Dr HH’s coat with the other, beseeching him not to lean too far over the edge. He was pretty disappointed not to be in the open air, daredevil that he is. The only way Vienna could be better is if it actually provided me with the advertised vegan waffles and pastries. If you know where to get them, let me know! 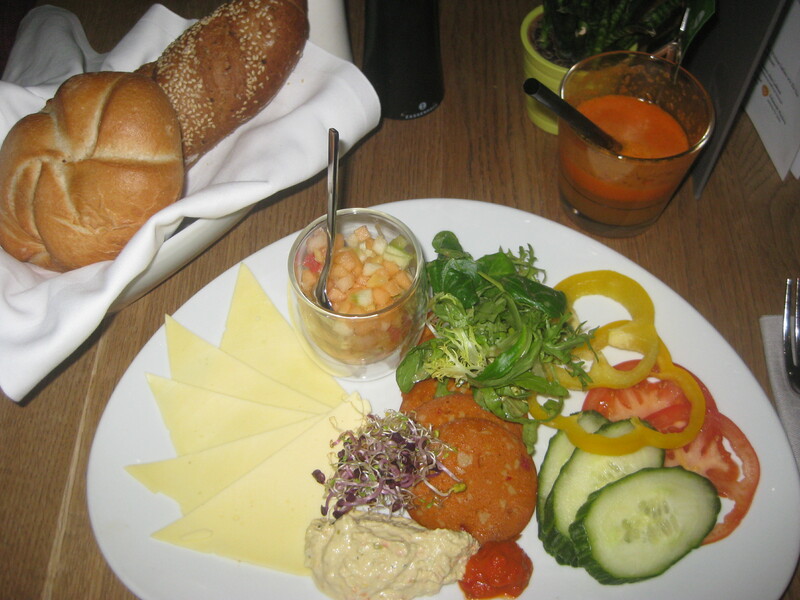 This entry was posted in Travel and tagged Blueorange Vienna, Delicious Vegan Bistro Vienna, Dr Falafel Vienna, Easy Going Bakery Vienna, Formosa Vienna, Maran Vegan Supermarket Vienna, vegan travel, vegan Vienna, Veganista Vienna, Veganz Vienna, Yamm! Vienna. Bookmark the permalink. I love Vienna too and can’t say enough good about it, either the food or the place. I think I ate a great deal while I was there (Veganista was definitely a highlight) and didn’t have a bad dinner once. Hopefully I’ll get to go back before too long! It was incredible. Also, it has enough vegan places that if I went back I could probably eat at all different places. Though I would definitely go back to Veganista too! The roof in that first photo is amazing. Fanciest roof I’ve ever seen. All the restaurants look interesting, I love going to asian themed vegan restaurants because they always have really interesting fake meats. One market I went to had so many fake meats I regret not buying a bunch and tasting them all to see if they were any different from each other. It is an amazing roof! It’s St Stephen’s Cathedral, right in the city centre. I rarely buy exciting fake meats, but I like eating them in Asian restaurants. Prawns are my favourite, I think. Lovely review of Vienna, we were there nearly 25 years ago, and would love to go back one day. We were backpacking then and did a lot of walking! 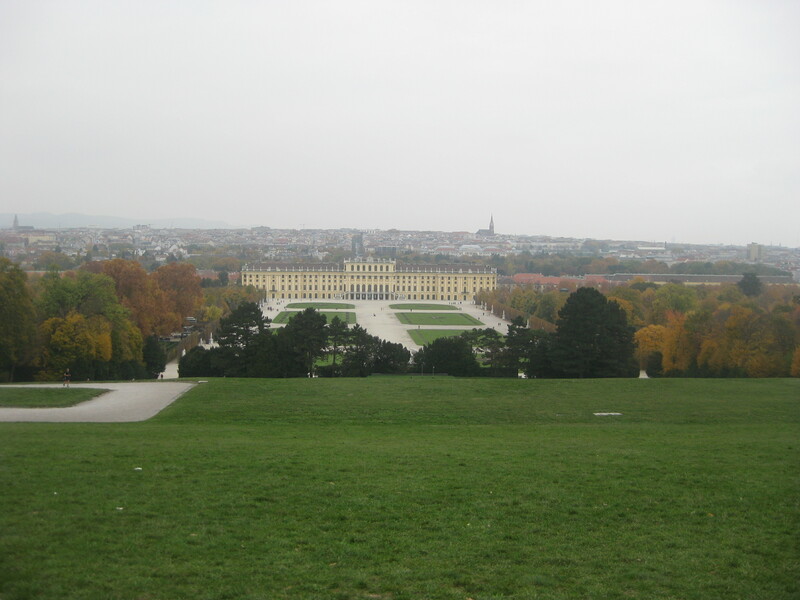 We spent a whole day in Schönbrunn. Such a beautiful city. I have a similar photo of the colourful roof of the church. 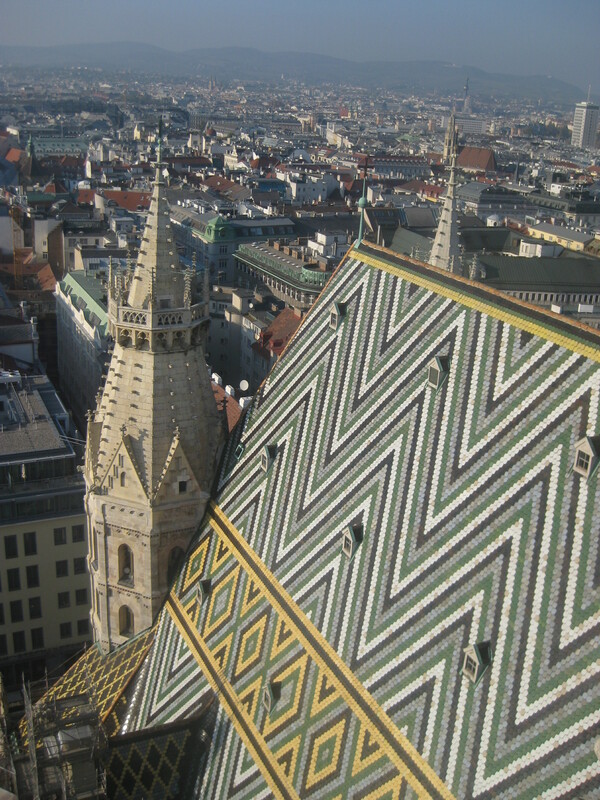 Some of my friends have said they were a bit underwhelmed by Vienna, but I agree with you, I think it’s breathtaking. It’s become very vegan-friendly, so I’d recommend a return visit!